The CXHairs commerce department is full up for the season. 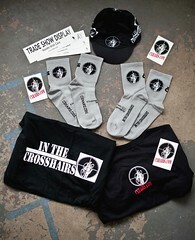 Socks, shirts, caps and stickers. All ready to make you the mackest cyclocrosser this side of Antwerp. The easiest way for you to get a hold of the good stuff is to catch me at a race. I will be at both days of Charm City and every MABRAcross race. Not from the Mid-Atlantic? No problem. We will ship to you. If interested, send me an e-mail at cxhairs@gmail. Or cut straight to the chase and send PayPal funds, also to CXHairs@gmail. Shirts are sized similar to American Apparel (they are not AA shirts) and cost $15. We have small through X-Large and one XXL. Want a Trade Show Display or CXHairs.com sticker? Buy something else and I’ll throw some in the mailer. If you don’t need any gear but want a sticker, no problem. Would love to get a buck or two donation, but it’s not mandatory. Send me an e-mail with your address and I’ll try my best to hook you up. This is a little bit like an NPR pledge drive without the tote bags or Nina Totenberg. Anything over my costs that comes from this gear goes back into the site. And speaking of the site, please shoot me a note and let me know what you think. Is there anything you would like us to do differently? You can also get a hold of us on Twitter @CXHairs and FaceBook. We have some exciting new features to be rolled out in the coming weeks. So stay tuned, as the old folks say. Thanks for reading and thank you for your support. I like your site already, but if you added Nina Totenberg (or the Nina Totin’ Bag) I would like it even more. Nina Totenberg and In the Crosshairs in the same blog. A storied past and a hallmark of the Liberal Establishment that is NPR. I love it. Both this blog and NPR and Nina Totenberg for that matter. When are you going to come out with the http://www.cxhairs.com Baby Bjorne model or the http://www.cxhairs.com B.O.B. Revolution stroller? Disclaimer, I have never received an NPR Totebag compliments of Nina Totenberg. I hate radio-thons. I donate off season. Just getting back from nationals. I can get these out this week.